(The Root) — Census data emerged earlier this year that projected racial and ethnic minorities will likely outnumber non-Hispanic white Americans by 2042. However, that anticipated demographic change doesn't necessarily mean that the balance of economic power or achievement will also shift. 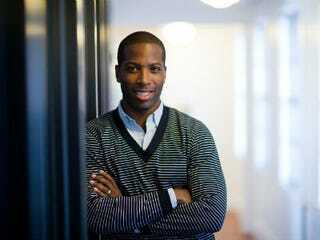 Tristan Walker, 27, a Stanford business school-educated tech guru, is hoping to have some say in that regard. Through his organization, CODE2040, he's attempting to increase racial and ethnic diversity in a booming — and predominately white — technology industry. In an era in which cell-phone apps are bought for millions, Walker aims to spark an entrepreneurial fire among blacks and Latinos by linking exceptional engineers to Silicon Valley companies. Through its inaugural pilot program this summer, CODE2040 placed five outstanding engineers into fellowships with tech companies such as Tumblr, Jawbone and RockMelt. The fellows also attended a speaker series, networked with eager investors and received mentorship from top-flight executives in Silicon Valley. "We need to crack the code," Walker told The Root. "We need to match the skills that tech companies want with the talented people who may not have access." He credits Sponsors for Educational Opportunity for motivating him to start CODE2040. As an undergrad at Stony Brook University who hailed from a low-income housing project in Queens, N.Y., Walker said the SEO program helped him get a job at an elite investment firm on Wall Street. While the world of New York finance has grown more diverse in the past few decades, Walker claims that the tech industry can better reflect our country's population. "Right now Silicon Valley is where Wall Street was 30 years ago," he said. Where other diversity initiatives are focused on education, programs such as Black Founders, NewMe Accelerator and CODE2040 aim to increase minority participation in the tech world and seek to build the kind of idea incubators that fuel the Valley. "For those who didn't go to certain schools — to MIT or Harvard — they haven't really had exposure to what Silicon Valley's all about," said Monique Woodard of Black Founders. The executive director of CODE2040, Laura Weidman Powers admitted it can be tricky to get plugged into Silicon Valley, where much of the hiring depends heavily on networking and personal referrals. "But CODE2040 is an easy sell to companies that are always looking for top talent," she told The Root. "They want exceptional engineers, and our students want experience at top startups. It's a win-win." After leaving Wall Street for Stanford, and later becoming director of business development for Foursquare, Walker now wants to inspire young students of color to pursue careers in pioneering fields. "Folks need to build products that understand the community," he explained. "What will Facebook look like when the country looks differently? We need a diversity of perspective to connect with the expanding consumer base." Met with tremendous enthusiasm in the industry (all five startups would like to return next year, with many more interested in joining), CODE2040 plans to expand next summer's fellowship from five students to as many as 20. To help ramp up the recruitment of engineers, the project recently hired a full-time program manager, Amy Schapiro. In addition, CODE2040 is considering expanding to budding tech hubs like Austin, Texas, and New York City as early as 2014, according to Weidman Powers. "We have learned so much about what it takes to be a founder," Alexandria Cattron, a CODE2040 fellow told The Root. "Hearing talented, high-impact individuals speak about their experiences has given us the confidence, tools and insight to start our own companies." Another fellow, Yuri Farias Gomes, spoke about the program's networking benefits. "We can already see some of the immediate impact now," Farias told The Root. "We know we'll realize how important these talks really have been in the future as we begin developing our own careers and starting our own companies." In the way that young people emulate their favorite athletes and celebrities, CODE2040 hopes to do the same with entrepreneurs — showcasing the opportunities and dynamism of Silicon Valley. Walker explained: "We want to create role models to serve as beacons of light for future students to aspire to." Hamza Shaban's writing has been featured on ReadWriteWeb, Thought Catalog and The Virginia Policy Review. Hamza keeps a blog on Web culture and technology at DrapersDen.com. Follow him on Twitter.